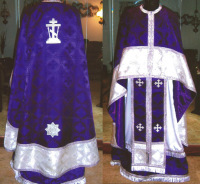 My vestments are made of the finest fabrics available. 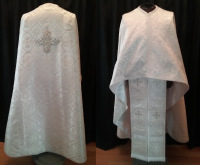 When custom-making your vestments, I try to tend to all details, no matter how small. 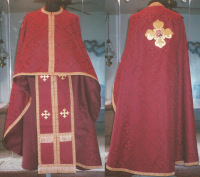 All my vestments include a full zipper up the front and clasp/button at the neck. 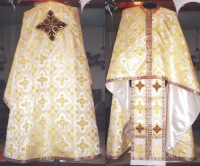 I place a strip of grosgrain ribbon along the front edge of the lined phelons to help prevent fraying of satin. 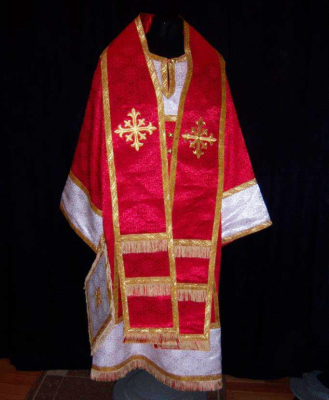 I also attach ties to the front of phelon to prevent it from shifting to either side. 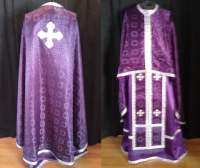 Of course, I can add or take away any detail you may request. 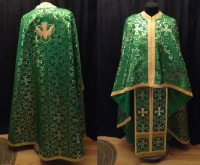 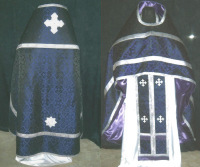 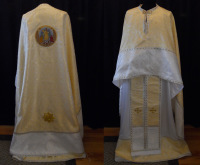 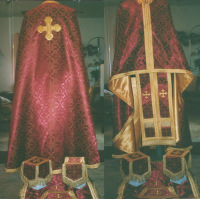 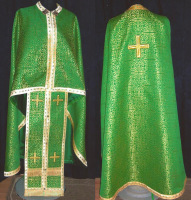 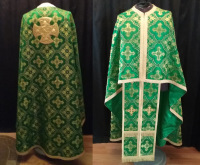 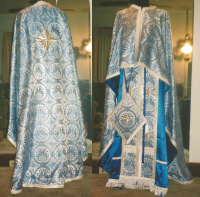 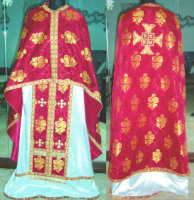 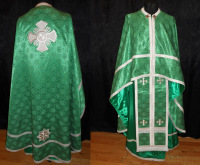 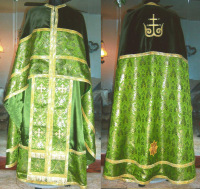 These are images of vestments I have created and customized for my customers. 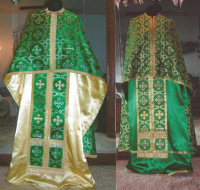 I have always done custom work -- which is why I have a wide variety of fabrics and galloons to chose from. 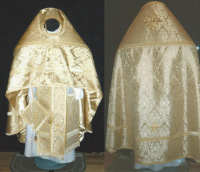 I feel this is one important way of making each garment unique. 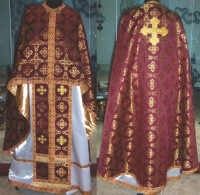 I have many other fine fabrics available. 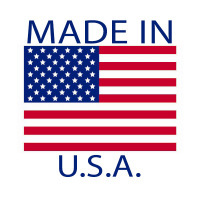 I will work with you to get the look you want while staying within your budget. 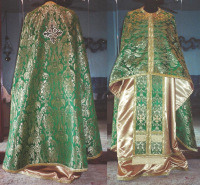 Keep in mind, most fabrics shown in photos do come in a variety of Liturgical colors. 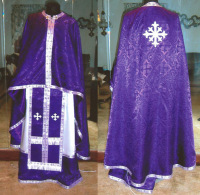 If you see a pattern you like, but want it in a different color, simply request a sample. 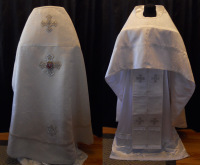 I make all sticharions from a lightweight, washable, poly charmeuse. 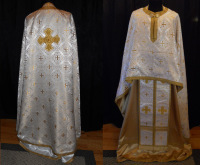 Upon request, I can use silk charmeuse or bridal satin. 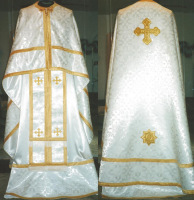 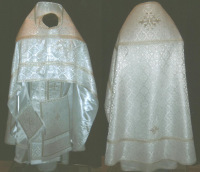 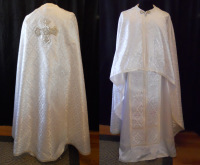 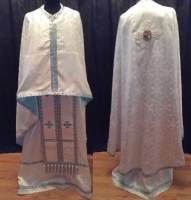 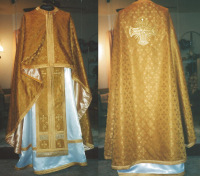 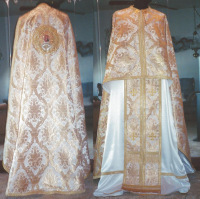 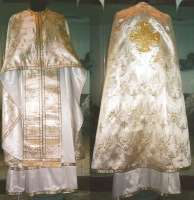 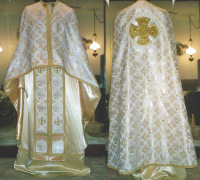 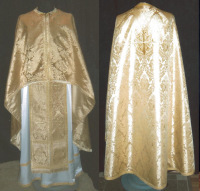 All Vestment prices include: Phelon/Robe, Epithrachiel/Stole, Zone/belt, Cuffs, (2) Chalice Veils, and Aer. 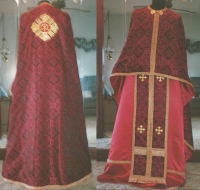 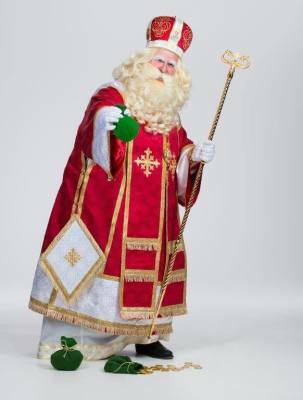 I created the St. Nicholas garment for the Saint Nicholas Institute. 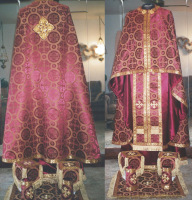 The St. Nicholas Institute is the one-of-a-kind spiritual retreat and educational symposium. 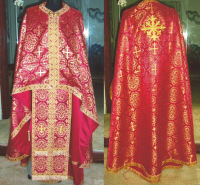 Contact me today to be sure that your church can have your Saint Nicholas garment in time for this December.